The battle outside Deephome rages on, but will our heroes be able to keep their rag tag army in check against the onslaught of the approaching Dragons!? That is such a stressful thing to think about! Did we ever imagine the Aludra who woke up on that slab all those years ago and would be commanding an army? They grow up so fast. Unfortunately, there is another shade from Aludra's past on the horizon. Surely... it cannot be...I will not say that heroes name! Trickster! Charlatan! 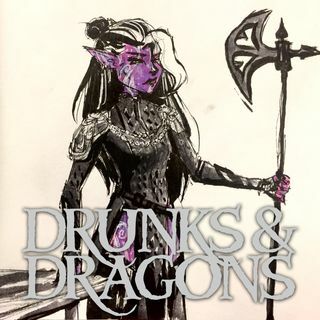 Podcast art by @sanderdoesart! Want the world to see your fan art? Tweet it with #DrunksAndDoodles or head on over to the forum.